It is impossible to discuss Renaissance architecture without discussing Leon Battista Alberti. He is hailed as the quintessential Renaissance man, and I suppose he is. He was very worldly. The illegitimate son of Lorenzo Alberti, it seems that he had a serious inferiority complex and set out early to prove his worth. One could say he became obsessed with proving his intelligence and skills in many fields. But if you take a close look, you will see that most of his work is theoretical. What is most surprising to almost everyone is that he was an ordained Catholic Priest. There is ample evidence that he only used his position as a Priest to further his personal ambitions. In his defense, that was not so uncommon at that time. 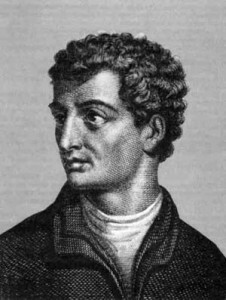 Alberti was unquestionably a humanist. He was interested in man … God, not so much. In all of his writings, according to Cecil Grayson, noted Alberti expert, even those that include discussions of the Church and Catholic Faith, he never mentioned Christ. I can say this as a fact regarding his Ten Books on Architecture. Think about that. Here is a Priest, who was secretary to three Popes, and in all of his writings he NEVER mentions Jesus Christ. That should be pretty telling. Architecture was young in Asia, flourished in Greece and mature and perfected in Italy. Think about the absurdity of that statement. If any art form is perfected, then it ends there. There is nothing you can add to it. There can be no new valid ideas. And this is what was taught in history class of most schools of architecture and still is. Most rejected this absurd premise, but some embraced it. Alberti has reduced architecture to issues strictly related to the visual aesthetics; and visual aesthetics as an abstract concept. Beauty has never stopped any criminal that I know of in history. And yet I agree with Suor Maria Gloria Riva (http://adoratrici.culturacattolica.it/), who has said that beauty will save the world. But she is not speaking purely of aesthetical beauty. For this reason, an entire article should be dedicated to the concept of beauty. Alberti did a lot to perpetuate the myth that architecture achieved perfection during the Renaissance. It was a great time to be an architect because wealthy families like the Ruccellai, Strozzi, Medici, and other wealthy patrons, financed the work of countless endeavors, artistic and otherwise. 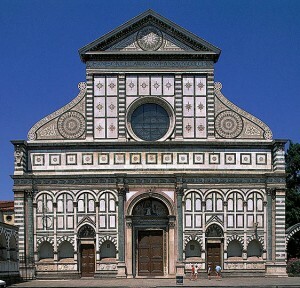 This is true of the facade of Santa Maria Novella, perhaps Alberti’s most famous work, commissioned by Giovanni di Paolo Ruccellai. Alberti was clearly a brilliant man. His knowledge of science, art, architecture and mathematics is well documented. He spent a great deal of time reading, and was fortunate, due to his position within the church, to access documents that would have been inaccessible to most anyone else. He capitalized on the privileges provided to him because of his Vatican connections. While living in Florence and after returning to the United States, I began reading more and more about this man. I learned that he is a man of extraordinary contradictions. Neo-neo classicists often refer to Alberti as a justification for their approach to architecture. And here is what it is: It is a justification to totally ignore what architecture is really all about, as I mentioned in the first article …. SPACE. This is why Pope John Paul II so correctly used that word many times, when talking about what an architect occupies himself with. People in the U.S. (certainly not in Florence), would be surprised to hear one call Alberti a modernist. But that is exactly what he was. Without question. The traditionalist of his time would have insisted on using Latin as the only form for expressing oneself. 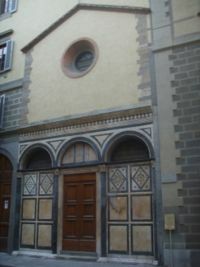 Alberti insisted on the importance of using the vernacular in both writing and architecture. This is a fact that so-called ‘traditionalists’ conveniently ignore. The Church that he is most famous for (i.e. 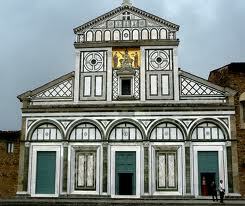 Santa Maria Novella), is a graphic work in the vernacular. It is taken from two very important pre-existing Churches in Florence; San Miniato a Monte and San Salvatore al Vescovo, which I believe is the oldest Church in Florence; certainly among the very oldest. It was the inspiration for his two dimensional exercise. There are still plenty of people who believe he designed the entire church. He didn’t. His intervention is limited to the thickness of the stone covering the facade. communicate effectively. You also have a very restricted audience. Alberti was very clear that by using the vernacular it is possible to communicate to the largest group of people. Every culture has its own vernacular building forms. The neo-neo classicist or false traditionalist has to deny this. And in reality, these individuals are not really even classicists nor traditionalists. They are eclectic plagiarists. As Catholics, are those the individuals we want guiding the direction of Church architecture? Of course not. That is why it is so important to understand why Brunelleschi was such a great architect and would dismiss or pity anyone who copied works that are hundreds of years old merely for their ‘stylistic’ (or aesthetic) aspects. Giovanni Michelucci once told me that as an architect, “if you don’t understand man, you don’t understand anything.” Brunelleschi understood the people and the times in which he found himself. In the next article we are going to show further evidence of the fact that the Renaissance was not the great period in history we are lead to believe from a Catholic perspective, but really only great from a secular humanist perspective. And that is not an insignificant thing. You may be asking yourself, if you have read the previous articles, where is this guy going with all of this. Well, my intent is to show that we have a moral obligation to stop spending millions of dollars on reproductions that are a hodge-podge of architectural design elements that come from a culture without any concern for the vernacular that Alberti insisted was essential. Why is the vernacular so important? Because if we as a Church are going to speak to the Indians, Vietnamese, Chinese, Venezuelan, Mexican, Filipino, etc., etc., we better start speaking a shared language that comes from their culture and personal experiences as well. It’s easy to copy someone else’s great ideas with the financing of a wealthy patron. It takes serious effort to sit for hours and hours and listen to different members of the parish, from the richest to the poorest and to begin to get ideas of how spaces and form can nurture, comfort, create the sense of the sacred and inspire the faithful in prayer. Are we honestly supposed to believe that only architects from 500 years ago were capable of this? It flies in the face of faith and reason. The next article in this series will define nostalgia, with respect to architecture, but also in the broader sense of the term. Next Article Do We Bring our Faith to the Sport Field? As far as an Italian saying Italians perfected something…not so unusual! (I’m Italian). Thanks for the article. Looking forward to your article on the concept of beauty. Thanks for your comment Maureen. I think my Florentine mother got it right when she said, “Firenze e’ un museo” (Florence is a museum). It only appears perfect to those who visit it from the outside; in a similar way to those who visit Disney World. Living and working there is a different matter. While it is true that the Germans decided to not bomb parts of Florence because of Hitler’s love of architecture, they blew up large sections of Florence, including the area around the Ponte Vecchio; so much so, that all of Por Santa Maria and Via Guiccardini were reduced to rubble. You raised a very interesting point. Giovanni Michelucci, who I have referenced a few times, left the University of Florence as the head of the school of architecture, to some degree, due to his dissenting position to rebuild that historic area exactly as it was. There was a big argument over how the reconstruction should occur. The fact is that some of those streets in the medieval section were so narrow and some of the living conditions were so squalid, that rebuilding everything the way it was, was clearly seen as irresponsible by many. Just because something is really old doesn’t mean it is great. Americans tend to think this is the case because we have so little that is very old by comparison. In fact, the oldest buildings in the U.S. (outside of St. Augustine, etc. ), aren’t even considered old by Italian standards. Of course every old building in Florence is not great. But it is unquestionably a great city! And as far as individual great buildings go, I think Michelucci’s building on the corner of Via Guiccardini and Via dello Sprone qualifies as much as anything else. BTW … I found your article on First Things (Aesthetic Drive), to be truly fascinating. I lived next door to a Villa on the outskirts of Florence that was once owned by Albert Speer. The then owner was a friend who told me some interesting stories. Thanks again! I believe her. It’s not as big of a stretch as you might think. Practically every country has dominated Italy at one time or another. There are a number of “Rogers” in Italy among many other anglosaxon names, that go back many generations. Why not Irish. Outside of the U.S. there are probably more people with a broad range of foreign names living in Italy than anywhere else.